Bruce Robertson and Dianna Wakelin sweep in the B event. Martin Medema and Marco Medema sweep. Skip Doug Van Hierden watches as Katie Lemire, Brendan Grant and Lindsay Grant sweep into the house. It was a fun weekend of curling and socializing at the Fort Macleod Curling Club where they hosted the annual Farmers and Friends Bonspiel with 12 teams competing. 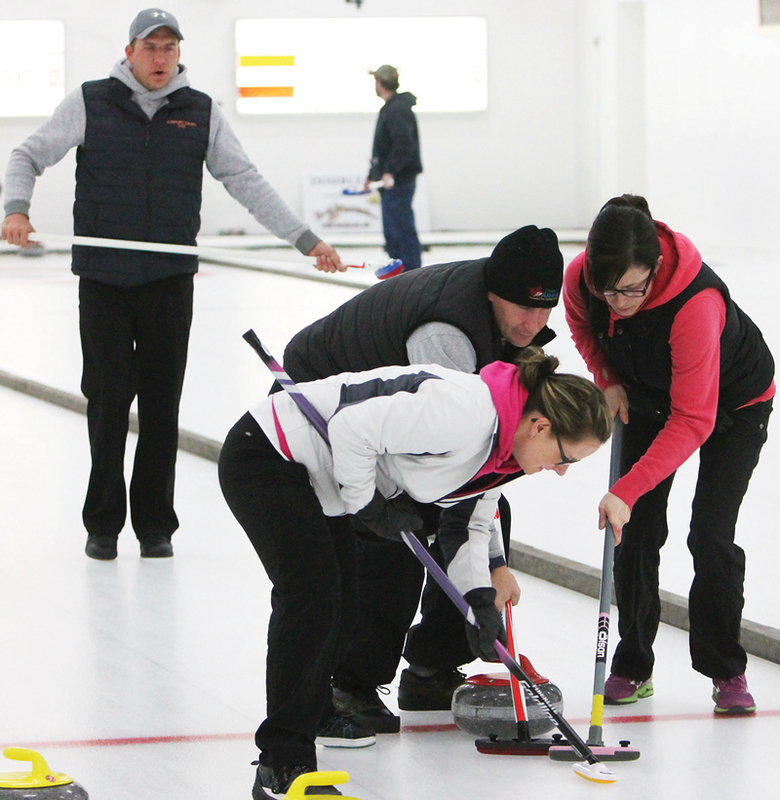 In the ‘A’ Event, the Doug Van Hierden rink comprised of Doug, Katie Lemire, Lindsay and Brendan Grant came out on top. 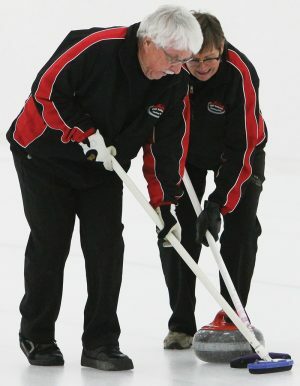 Second place in the ‘A’ event was the Melvin Jones rink which included Bob Ripley, Linda Ripley and Ellen Potvin. First in the ‘B’ event was the Travis Doyle rink comprised of Brady Hester, Cody Hugo and Jim Jenkins. In second in the ‘B’ event was the Bruce Robertson rink, which included Dianna Wakelin, Phil Wakelin and Michelle Harris. The ‘C’ event was won by the Shane Doyle rink, whose members included Yvonne Medema, Martin Medema and Marco Medema. In second in the ‘C’ event was the Bruce Faulkner rink, which included Naomi Faulkner, Bill Lichtenberger and Sue Lichtenberger. 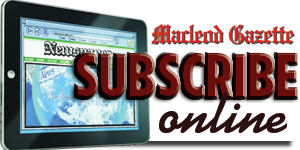 The team draw to the button sponsored by the Fort Macleod Vet Clinic was won by the Shane Doyle rink with a measurement of 4 5/8 inches. Bonspiel sponsors were Rocky Mountain Equipment, Viterra, Green Prairie International, Fort Macleod Vet Clinic, D-4 Farms Ltd., UFA Petroleum, LVE Transport, Tree Trunks Contracting, AJM Seeds, The Real Estate Centre, Hank Van Hierden, Vanee Farm Centre, Nutrien Ag Solutions, Davis Dodge, Hanlon Ag, Westco, Richardson Pioneer (Nobleford), Ritchie Bros., Scougall Motors, Western Tractor, Crocus Coulee Ranch. 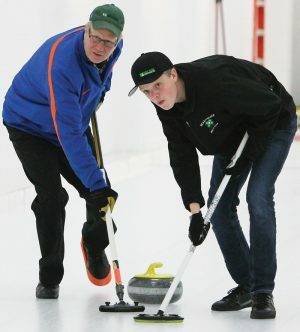 Up-coming bonspiels at the club are the Junior Bonspiel on March 1-2; the Ladies Bonspiel with a ‘60s theme on March 8-9 and the season will end with the Men’s bonspiel on March 29-31. To register for these bonspiels, drop by the rink or call 403-553-4172 or e-mail ftmaccurl@hotmail.com.